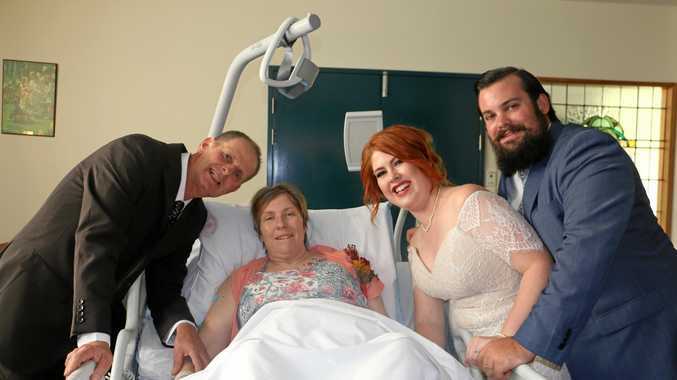 WEDDING WISH: Dale and Trish Rieck with daughter Libby and her husband Andy Wright, who married in the Ipswich Hospital chapel to ensure palliative care patient Trish could make it to the ceremony. LIBBY Wright's wedding day inside a hospital might not have been the one every girl dreams about, but it was the wedding she wanted. The ceremony was a small affair, arranged within 24-hours, and held inside Ipswich Hospital's chapel. The last minute wedding was made to ensure Libby's mum Trish, who was in palliative care, would be able to see her daughter marry the man she loves. Trish had a rare cancer and was receiving end of life care at Ipswich Hospital's Palliative Care unit. She died on January 23, five days after the wedding ceremony. "It meant the world to have her there," Libby said. The Boonah couple got engaged in October 2017 and had planned to marry in September this year. But Trish's deteriorating health made them reconsider their plans. "It was Andy who made the decision. He said 'we're going to get married tomorrow'," Libby said. "You never imagine your mum might pass away before you get the chance to get married. You think you are going to have another 30 years together." After a call to celebrant Andrea Schumacher the Boonah couple hastily brought forward their planned nuptials for the following day. Libby said as soon as they got word that the celebrant was available she rushed out to buy her mum a new mother-of-the-bride outfit to wear to the wedding. Andy wore a borrowed ring but surprised his bride when he produced a wedding band that had already been arranged, while Libby wore a gorgeous wedding gown that she had tried on for the first time that day. Libby was the first of Trish and Dale's four children to marry and the intimate family affair was a special moment for all to cherish. "It was so special to be there with mum, and also with dad, who said he couldn't imagine our wedding day without her there. "We got engaged in October after Andy kept telling me he was never going to get married. "Mum said she always knew he would propose." Libby said it had been an emotionally-charged few weeks. "We've been sharing old memories and trying to have a laugh," she said.